Load bank testing places a resistive load onto the output of the UPS whose technical performance can then be tested and verified. Mains failures can be simulated and the UPS put into standby, on-line and Eco mode and the maintenance bypasses switched (both internal and external). Load bank testing can also be used to verify the battery runtime capacity and recharge times. Batteries are connected into battery strings, which may be paralleled together to give a UPS system its overall battery capacity. Using a load bank to test the battery provides several benefits. Firstly the critical connected loads do not have to be used to test the battery, where a sudden failure could lead to a load crash. Secondly, the battery test on a load bank can be run for far longer and long enough to identify any failure in battery capacity. If any of the battery strings has a failing or weak battery it can take some time on discharge before the overall DC battery voltage across the strings starts to collapse. The only other way to test the battery is to inspect and test each battery block using a hand-held battery tester and then to analyse the recorded results. When is the best time to load bank test a new UPS system? Whilst load bank testing can be used as part of the commissioning service, it can for some battery builds and sites be more informative at least 1-2 weeks after the initial commissioning. This allows the battery set to settle and equalise charge across the battery strings and individual battery blocks. Remember that batteries rely on a chemical reaction and whilst UPS batteries are manufactured to fairly tight tolerances, variations can and do occur. At EcoPowerSupplies we can provide AC load banks from 100-200kW through our service team facilities. These load banks are owned by the company and used both in our warehouse and test facility and out on site. Larger sets are hired in from partners. DC load banks are also available. Whilst the load banks we use are resistive, reactive load banks are also available. Load banks are fairly heavy pieces of hardware and will give off heat when used. Therefore it is as important to plan the logistics and electrical connections for load bank testing, as it is for a UPS installation itself. It is standard practice to supply suitably rated cables for the UPS system and specified load bank and of a sufficient length to place the load bank in a suitable position. Ideally this should be as near to the UPS as possible but often this cannot be done if the UPS is within a data centre. 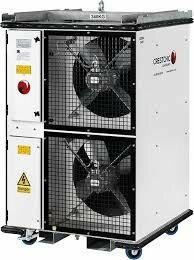 The load banks may have to be placed nearby and ideally within 15-20m and with sufficient airflow for the fans to operate and dissipate the heat generated. Noise output from the load bank in or near working environments must also be cater for. Other locations specific issues to take into the project plan include emergency exits, access, work areas, sprinkler systems, security and other environmental alarm systems. During the load bank process, measurements are taken and recorded. These can be analysed to identify any issues and used as part of the final load bank testing report. A load bank can also be used to test a local standby generator, either separately or as part of the overall power continuity plan together with the UPS system. Generator load bank testing places a sufficient load onto the generator output and can help to provide confidence in the overall generating set, alternator response to load and voltage stability changes, frequency and overall efficiency of the control system. Generator load bank testing can also be useful for clearing fuel and carbon deposits from pistons, exhausts and engine castings. Some sites run monthly generator testing using either site loads or a hired load bank. Load bank testing pricing should provide for a fully comprehensive service. This should include all logistics (delivery and collection), set-up and engineer time, temporary cables supply and connection and de-connection after the testing is complete. If you would like to know more about our load bank testing service please contact the Eco Power projects team.